The Long-Term Ecological Research (LTER) program, sponsored by the National Science Foundation, monitors ecological phenomena in a range of environments. The program supports 16 sites in North America and two in Antarctica, including the newest site in the McMurdo Dry Valleys—one of the most extreme deserts on Earth. The McMurdo LTER, headed by Dr. Robert Wharton, Jr. (DRI), is the coldest and driest site. The study attempts to understand two processes: the influence of physical and biological constraints on dry valley ecosystems, and the effects of material transport on these ecosystems. All ecosystems are shaped by climate and material transport, but nowhere is this more apparent than in the dry valleys. During a few summer weeks, temperatures breach the freezing mark and glacial melt feeds ephemeral streams and perennially ice-covered lakes. This period is essential to sustaining life because most material transport (organic carbon, nutrients, and sediments) occurs during this time. Biota that persist in this harsh environment are not evident to the casual observer. Microscopic plants and organisms find refuge in small meltpools on the glaciers (cryoconite holes), on beds of ephemeral streams, in ice-covered lakes, and in the soil. One of the study’s first steps was to establish a data acquisition network to document the complex interactions between the biological and physiochemical environments. Harsh weather conditions in the dry valleys offer unique challenges for data collection. Equipment must survive extreme temperatures and winds, a four-month absence of solar power, and extended periods without maintenance. Furthermore, the diverse weather conditions require a weather network, as opposed to a single station common at other LTER sites. 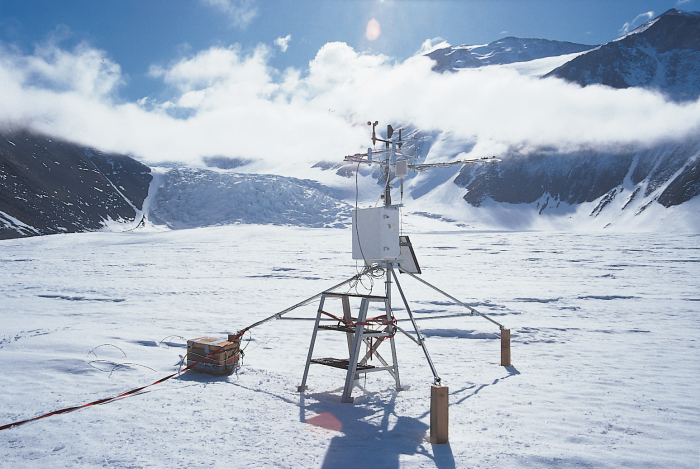 By the completion of our third field season (February 1996), we will be operating 11 Campbell Scientific meteorological stations that comprise the McMurdo LTER Automatic Weather Network (LAWN). Six of these stations are located on lake shores, and four are mounted on wooden stilts on local glaciers, including an eddy correlation station that aids in energy balance studies. In all, the McMurdo LTER operates more than 30 CR10s and two 21Xs. In the future, the stations will transmit real-time data to McMurdo Station (~100 km east) for access via the Internet. This data will help us plan repairs and upgrades, and will be used to compare Radarsat (Canadian satellite recently launched) imagery with surface conditions. Research on the influence of physical and biological constraints on dry valley ecosystems, and the effects of material transport on these ecosystems.